Customer interaction maps are great tools for managing the brand experience with a holistic approach. These maps combine different elements of the experience—from advertising and packaging to using a product. This empathetic approach to following each of the customer’s interactions with the brand can be used to identify short-comings in the overall experience and guide the brand management team to make intelligent refinements, or even radical changes to build the brand’s marketplace equity. The key to effective customer interaction mapping is not only spending lots of time talking to customers, but asking honest questions about what you can do to improve the customer’s experience. A great starting point is to envision each possible touch-point where a customer intersects physically with the product or virtually with a brand expression, such as a carefully placed magazine advertisement. Let’s take a look at a generic process map that would be applicable to most products in marketplace. During the process of refining the interaction map, it is important to keep the elements fluid to quickly adapt to new insights by keeping the map on a whiteboard or sketched on large sheets of paper. 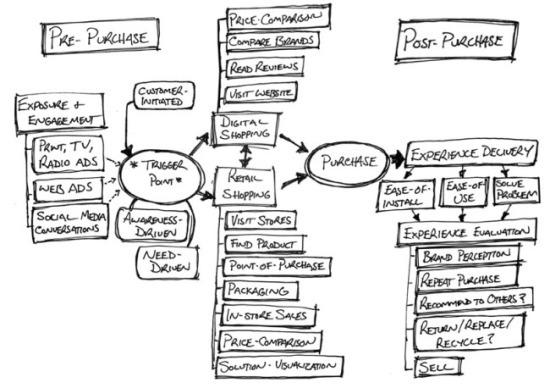 While at first glance, a customer interaction map can seem a bit chaotic, it does separate into five basic steps around the event of purchasing a product: pre-purchase, trigger point, intentional shopping, purchase, and post-purchase. A key observation of the pre-purchase step is that some points of interaction are customer-initiated, such as social media conversations about a company and its products, while in others the company initiates the interaction, such as product advertising while the potential customer is watching television. Brand and product management teams must convey a consistent experience across these and other channels of interaction to ensure that one experience with the brand at a neglected website, doesn’t betray an outstanding retail display. The trigger point is an event that happens for the customer where they realize the need for purchasing a product that may be independent of company actions. Possible trigger points could be their existing product breaks down, needs an upgrade, a problem occurs that needs a new solution, or directly responding to the product ad itself because the new product has the ‘gotta-have-it’ factor. Up until the trigger point, all of the advertising and messaging has gone into memory, to be recalled as the initial consideration set. In the pre-internet days, that consideration set was a closed loop with few additional entrants. Today, the availability of information can introduce many more products for consideration, making the intentional shopping period between the customer’s trigger point and actual purchase that much more important. When customers are in the intentional shopping phase, each interaction is critical to winning their business. Customers may follow a dual path of digital and retail shopping, either of which could result in a purchase outcome, but the total interaction experience needs to consider both paths. As you interview and observe customers about their experiences at this phase, particular attention should be paid to opportunities for improvement and engagement that could make a competitive difference for your brand. If potential purchasers have their feelings and preliminary findings confirmed by the purchasing experience, the more likely they will complete the transaction and set a course for enjoying the product. Finally, the customer interactions during the period after purchase, defined as touch-points like product delivery, ease of assembly or installation, and ease of use will determine whether a product is returned, kept begrudgingly, or, in the best case, creates a fan of the brand. When customers feel like they’ve been well-guided in their first experience with a product that they spent some time, effort, and money to invest in making their lives better, that spark of brand loyalty can be sustained for the long term, creating resonance for repeat purchases.